Turquoise door? Always a yes. And just a little by asymmetrical on that facade? Oh baby, those colonials knew what they were doing. The foyer hall is a dang delight. Historical millwork out the yang. I dream about this chartreuse living room. And yes, 18th century decoration actually was pretty colorful. Also, that Brunschwig “LeLac'“ slipcovered chair right here on the left makes my heart so happy. The dining room harkens back to one of the homes previous incarnations, a local inn and tavern. The library has a little museum of curiosities displayed on the central table. So much respect for living with, and loving, and accepting this weird historic kitchen. So many people would just gut the crap out of this and put in a white Christopher Peacock yawn of a kitchen. Not here! Not das Bilhoobs! Which is what I call Jeffrey Bilhuber in my head. Upstairs, the guest rooms are all named after Revolutionary Way generals, which my history major heart just adores. Also, n.b., if you like the Revolutionary War and historical Long Island, you gotta go watch Turn on Netflix. You’re welcome. We know I’m (still) not a red person, but the master bedroom is elegant. And I do love the green painted floor. 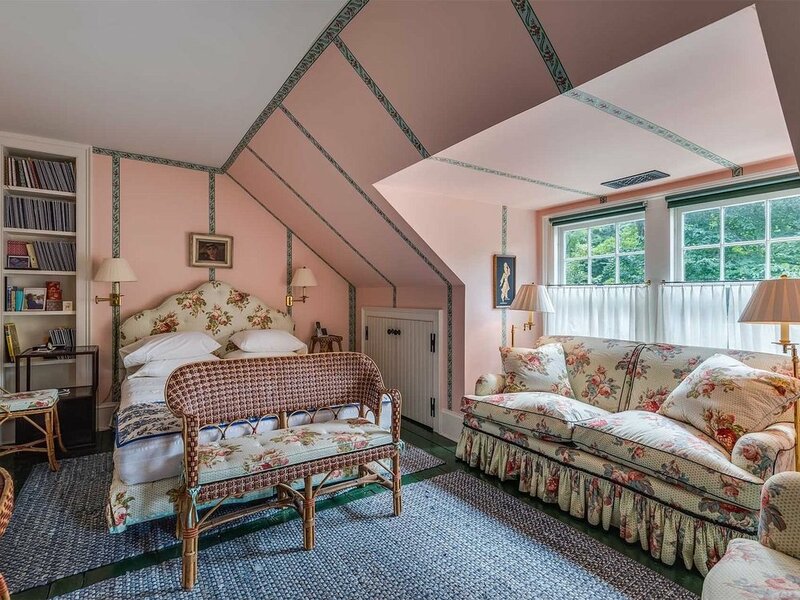 However, I am obsessed with this pink guest room. The tape trim is so dang charming. Another bedroom is so beautifully lived-in and cozy. Bilhuber’s son’s hang out room is, frankly, what boy dreams are made of. Chic, and historic, but also kind of a mess in the best way possible. Love the solar system hanging from the ceiling. And props for keeping the K’Nex rollercoaster out — we all know completeing that thing is an achievement. And if you don’t know that, then you either didn’t have an elementary school aged brother (or son!) in the ‘90s. This is also the third turquoise room if you’re counting, which I am. The house has a U-shape and the porches surrounding a charming, casual courtyard. 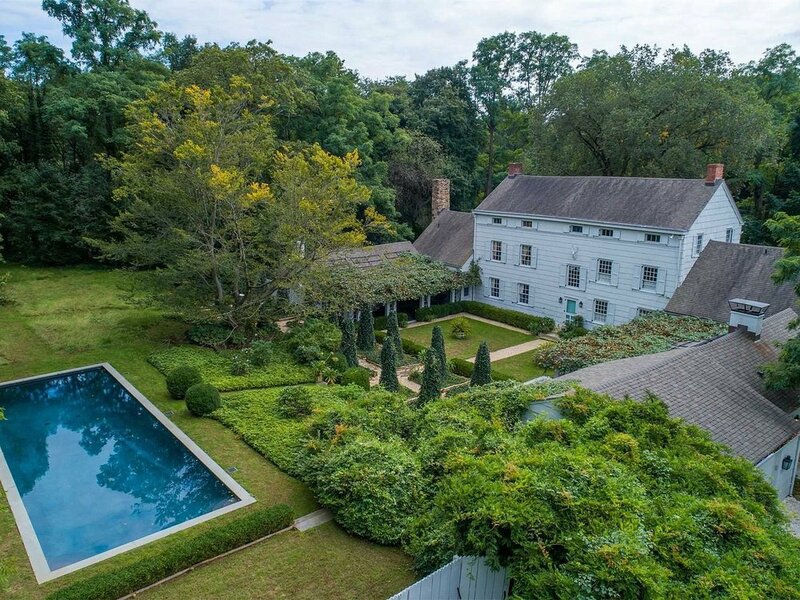 The landscaping is a a scruffy take on 18th century formality and boy oh boy, do I love it. OOH GURL. This house is a freaking opus. To make a historical home actually historic and actually livable is shockingly difficult and Bilhuber does such an incredible job. This house has been published a bunch and gotten so much well-deserved heat. And now you can have it!